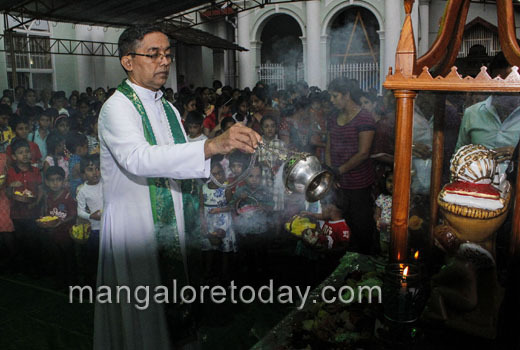 Mangaluru, Sep 3,2016: A look at a premier church/parish of Milagres marking the 4 th day of the Novena, Sept 2, is of interest to people of the city. 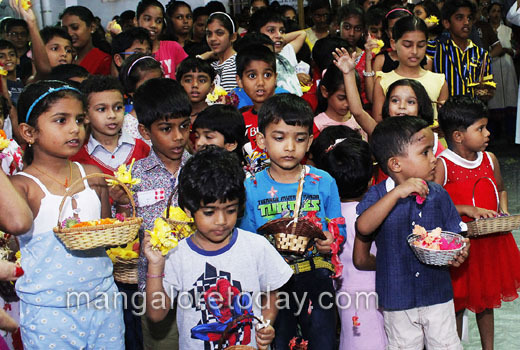 The event was marked as the other days in many churches and institutions where Konkani Catholics are found in many places of the world as all over in Kanara, in preparation for the unique ’Monthi Fest’ the Birthday of Mary the mother of Jesus Christ. On this day of the novena, special emphasis was given to the earthly mothers reflecting on their roles and special honour was given to them in various ways. History Recap, Milagres : The Parish of Milagres, once covered the entire Eastern half of the present city of Mangaluru, now covers Falnir,Highland, Attavar and surroundings, was first established in 1680,on a land given by Rani Chennama of Ikkeri and is now over 329 years old. Rt.Rev.Thomas De Castro, Vicar Apostolic for Canara and Malabar, established the primary Church and his official seat on the same spot that the present Milagres now stands even though Rosario was already in existence a short distance to the West. De Castro died on 16 July 1684, his built-up tomb can be seen near the entrance to the present cemetery on the South side of the Church. The spot, actually was the nascent Milagres which had undergone reconstruction in 1756. The Milagres Church which was moved and constructed at its present spot in 1801, following the captivity era was dedicated to Our Lady of Miracles (Milar Mai). About 1910 the facade of the Church collapsed - this compelled the extensive rebuilding and got its present magnificent form. The main alter, the statues and so on now seen, were originally brought from France for a Church planned byFr.Alexander Dubois, (a Frenchman, nephew of the famous Abbe Dubois buried in Cordel,Kulshekar) who wanted them for the Cordel Church; he was also Parish Priest of Milagres, and decided that they would better suit the magnificent Milagres Church. The reconstruction was overseen by the then famous Italian Jesuit missionary -architect, Fr.Augustus Diamente sj, who is credited with several Catholic monuments of the era. Milagres Church in the heart of the City as seen today, was dedicated in 1911. 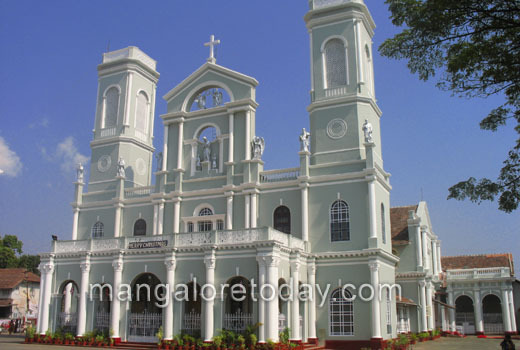 The Milagres parish as such has been in existence since 1680, ( the 325 year Jubilee was marked with celebrations on January 9,2005)being the second parish of Mangalore after Rosario. Mangalore, has always been a colourful mosaic of people,cultures,faiths,languages, prospering amidst a nature blessed region on the west coast on the shores of the Arabian Sea. 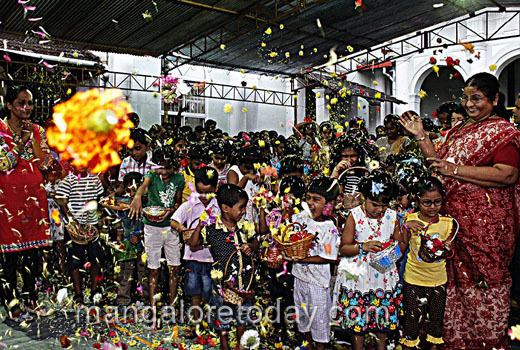 The ’Monthi Fest’ Novena : The Novena , a nine day preparation for the feast commences from August 30. Particularly children gather flowers from the surroundings of their homes (or now from the market) and carry them to the church in pretty little baskets or trays. 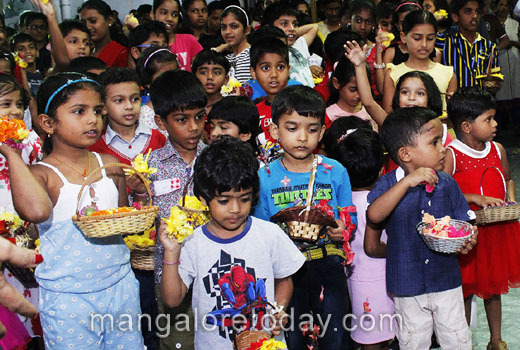 Then after mass, they gather around the decorated statuette of Infant Mary and shower it with flowers singing a special hymn in Konkani ’Sekked Sangatha Melian’ (Let us all gather together). Weather permitting, in the open yard of the church. 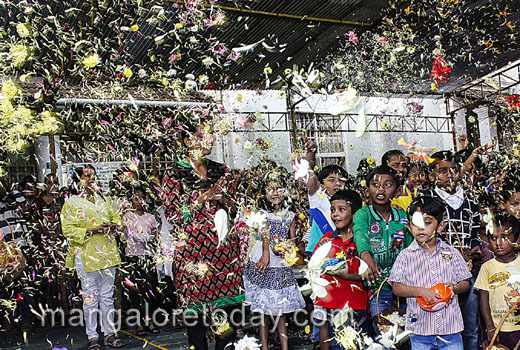 Toddlers to grown ups take part actively with joy. It is a thrilling sight to behold, the older folks too enjoy the sight with nostalgic childhood memories! 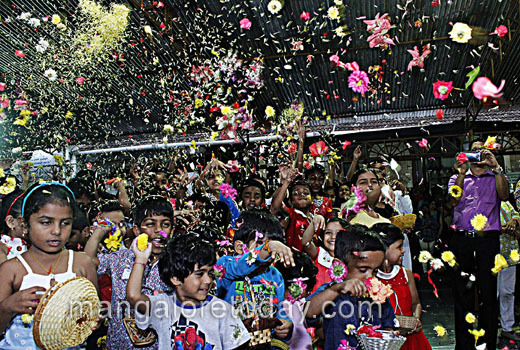 At Milagres the ceremony is held on the South side under a covered area. It is amusing to watch the children awaiting sweets after doing honour to the image of Infant Mary. The Infant Mary Image : As per legend, the first image appeared in about 1730, a Franciscan Nun, presented it to the Bishop of Como in Italy. On his death it was handed over to the Franciscan Nuns who developed great devotion among people to the ‘Infant Mary’ (now in Mangaluru a church is dedicated down below in Bikarnakatte). Due to Napoleon’s revolution when the monasteries were closed down, one of the nuns carefully saved it and handed it over to the Parish of St.Mark in Milan.